Or is there complications to designing it such as tightly matched components among other things I may not have thought of? Should be doable, I can't see why not. But I would recommend to simulate it in Spice first before building the circuit. In integrated design, scaling of currents is done via geometrical properties of the transistors and cross-matching. Which is something that isn't visible on a schematic like this, because a transistor looks like a transistor. But when building with discrete components, the exact behaviour is controlled by the outside parts, because you can't rely on such specs and mechanics. You might have to insert resistors in several spots to get everything working properly and predictably. The design could actually be simplified a bit, so simulation would help you in that regard. I've been building discrete opamps as you can see in the photo. All single opamps, except the last purple one which is a dual, one amp on each pcb side. 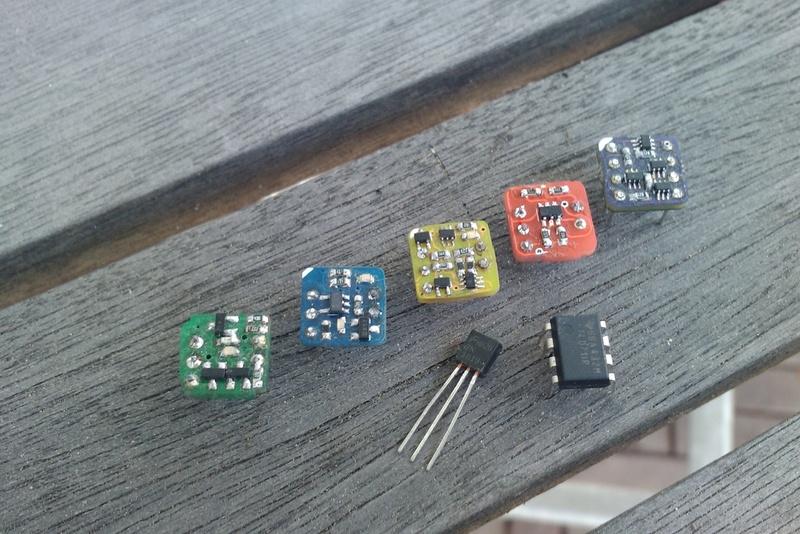 The yellow one has 10 transistors and 13 passives, which is a bit higher complexity compared to the CA3080. So you should be able to fit and build a direct plugin substitute. SMD arrays are the way to go in any case, because they already come matched and the thermal tracking is much improved compared to all singles. For the diodes use transistors as well, in the same package as the corresponding transistor. If not then thank you any way for your reply, I think it’s my next project to start working with then as I really really love circuits with OTA’s more and more these days and I adore discrete design and the amount of thought and effort involved in doing a project. I find that sort of job very rewarding myself! marshmellow wrote: Should be doable, I can't see why not. But I would recommend to simulate it in Spice first before building the circuit. In integrated design, scaling of currents is done via geometrical properties of the transistors and cross-matching. Which is something that isn't visible on a schematic like this, because a transistor looks like a transistor. But when building with discrete components, the exact behaviour is controlled by the outside parts, because you can't rely on such specs and mechanics. You might have to insert resistors in several spots to get everything working properly and predictably. The design could actually be simplified a bit, so simulation would help you in that regard. Sure, PM me your address and I'll send you a couple, I have more pcbs than I'll ever build in a lifetime. Same goes for anyone else interested of course. Unfortunately I don't have any more of the duals at the moment. 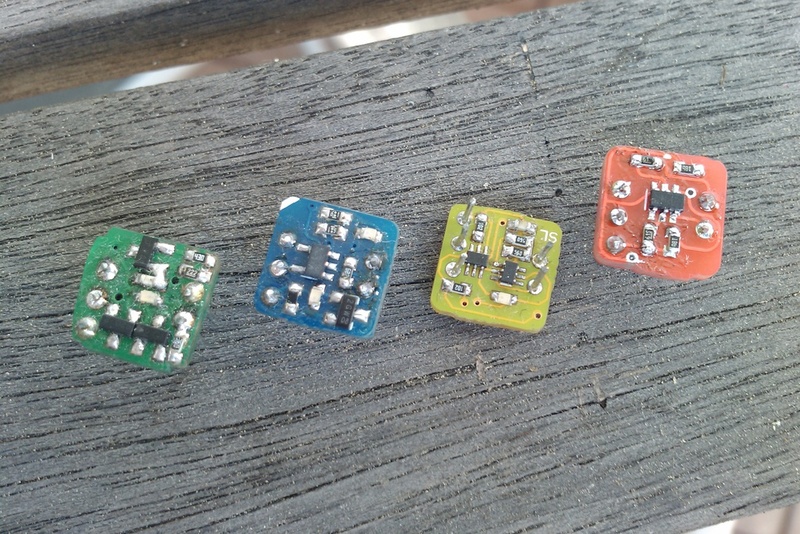 I tested the single opamps in a Rat, Hotcake and OD250, and they do offer some tonal variety compared to the stock ICs. Nuances, not night and day differences. But like you said, I also very much enjoy discrete electronics and it's fun designing and building these circuits. It's an interesting challenge to squeeze out as much performance as possible out of 1cm² of pcb real estate . The green one uses a dual JFET for the differential input, which went obsolete between the time I designed this a couple years ago and started building a couple months ago. It's also a very basic and simplified circuit because it used SOT23 transistors, which take up too much space to allow more advanced circuit techniques. The blue one uses a lownoise dual JFET from Toshiba and the rest is these mini duals, that allow a much higher parts density. The circuit is a simple one-stage folded cascode. The yellow one uses pnp BJT inputs with a standard two-stage topology employing more advanced elements like emitter current source, active current mirror load etc. The performance is actually good enough to use it in cleaner soundpaths (HIFI, recording, ...) as well. The red one is all FETs and a major PITA to build. Took me two hours of matching transistors and it still didn't really go where I wanted it to. I only built one . The purple one as I already said is a dual opamp. The circuit is similar to the single green one, but because of the smaller packages I was able to fit one on each side of the pcb. Passive parts for all of these are 0603, so still ok to handle. All you need is a fine solder tip, tweezers, fine solder and flux for soldering the little 6-pin packages. The difficulty in building these isn't the size of the parts, but the closeness to each other. Soldering one resistor can reflow another one because of the overall low thermal mass of the parts and the pcb. You have to start in the middle and work your way to the outside. While there are easier things to build it could be a nice project for people who don't have much experience with soldering SMD. Parts cost per opamp is around 1,50€, so not too much of an investment. Cannot find a better place to put it - what would be a complete anachronism in real science, may be a great new approach to stompboxology. So I suppose I should learn some more about sinking and sourcing current mirrors to start off with, if anyone can recommend some good reading material on either discrete design, OTA’s or sinking/sourcing current mirrors I’d really appreciate it. My day will consist of lots of research and coffee so I don’t want anyone to think that I’m not doing the work on my own either. Of course analog chip designers try to design out many of the variances so each chip performs the same as the next in production, but often the way to design out these effects is to use silicon manufacturing process' ability to match transistors precisely. All of those things (except maybe #4) are almost impossible to do nearly as accurately with discrete parts. That's not to say there's no point in trying to build an analog IC from discretes but it will not be able to have the exact same characteristics over temperature and supply voltage as an LM308 or a CA3080 or whatever. When you get to the classic synth chips (like the Curtis chips) the characteristics are even more bound up with the matching of on-die transistors and chip layout. Let us know how you get on with this as I'm sure you'll create something really sonically interesting. Small bear sell these new, they're back in production. koldman wrote: Small bear sell these new, they're back in production. same in the uk 3080's can be purchased from Bitsbox. I believe a company called Harris manufactures them now. I think still worth to clone one using discrete parts. Maybe a exact copy of 3080 will not produced, but a very interesting OTA will. When I was young I dreamed with custom chip companies, delivering ICs to the people. This time has not come yet! I keep my dreams.